Winter brings colder temperatures and raw weather – which can cause dry, flaky skin. 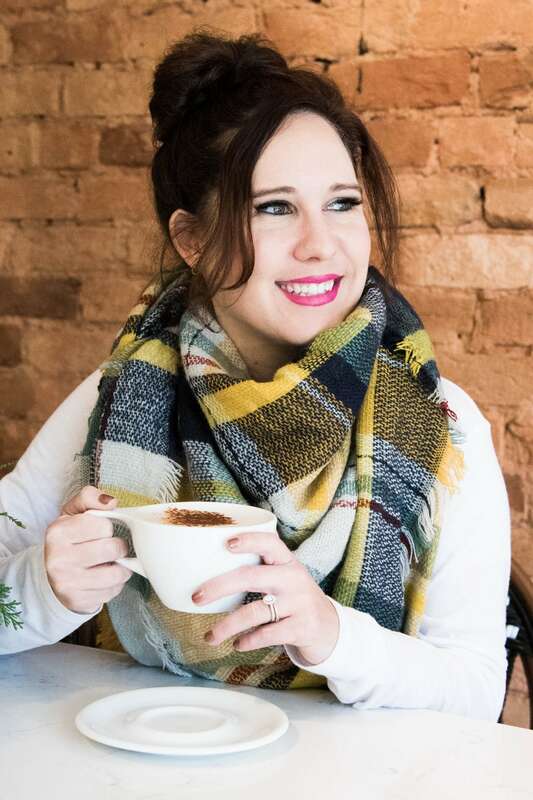 I’ve asked Organic Tan Face & Body spa owner, Lindsey Holder Rinehart, to give us a few suggestions on how to care for skin during these cold winter months. 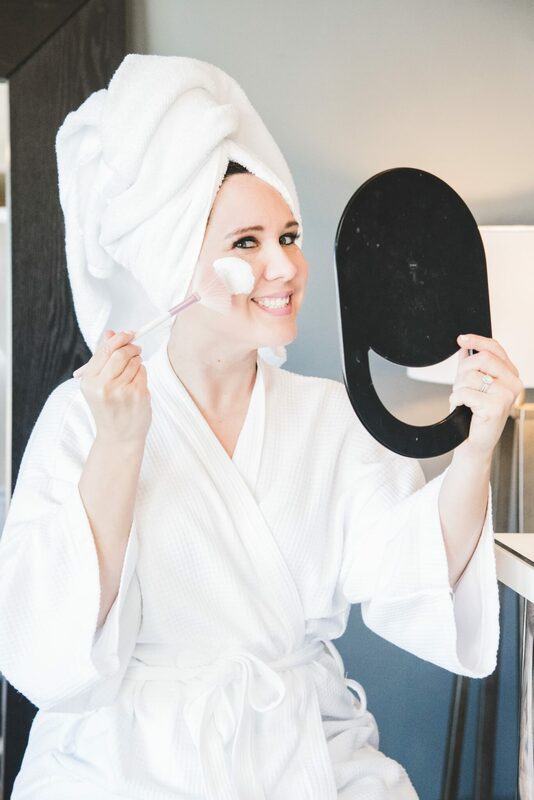 Lindsey is a former Celebrity Assistant turned spa owner and esthetician for over nine years. She has a love for both organic and science-enhanced products that assist her client’s natural beauty. 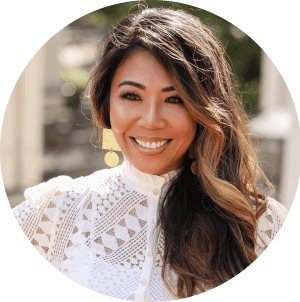 Her former celebrity experience allowed her to be exposed to top skin and makeup experts in the industry while traveling and experiencing the top spas and skin care centers. Among her other accomplishments include being a National Style Ambassador for Remington, author of two successful books and leads a spa team daily while overseeing her guests. Do you need to change your skincare routine in the Winter? Absolutely, depending on your location and skin type. I live in the south, so increasing my hydration is a must to slow down moisture loss during the colder season. 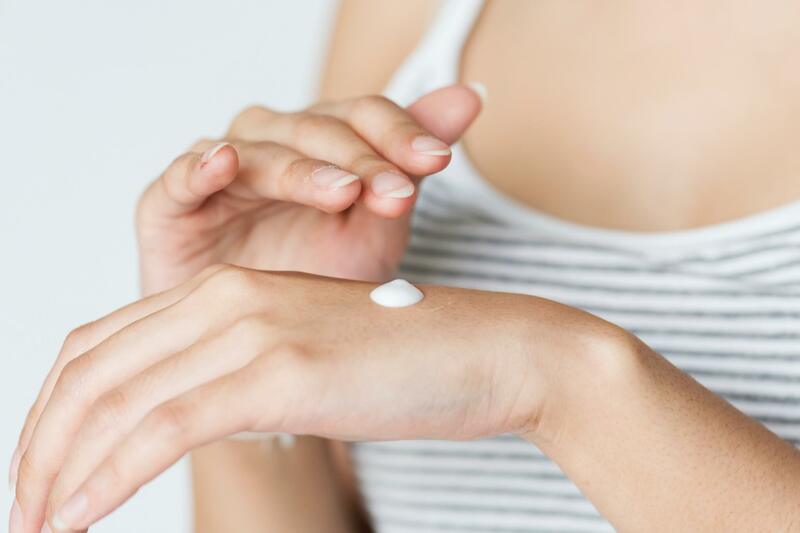 This is the perfect time to switch from a light moisturizer at night to a heavier moisturizer, oil, or balm to seal in moisture. Find out which one works best for your skin. If you can rotate them, it keeps the skin from getting used to the same product (no need to rotate too many; two to three products are my preference). I tend to use my heavier moisturizer in the winter only at night as it is too much in the morning for my skin. If cleansing oils are too heavy for you in the spring and summer, this may be a good time for you to use it, as your skin may better handle that extra hydration. Hyaluronic acid is your best friend. It not only plumps everything up, but it also is a humectant which reduces moisture loss by drawing water to the skin. Look for that ingredient in your serums and apply before your moisturizer. For those only adding a serum at night during the spring and summer, increase it in the morning as well. Use a hydrating toner instead of an astringent to keep too many oils from being stripped. Continue your skin routine after you have cleansed your face while it is still damp to lock in those hydrating ingredients. How do you protect against dry, itchy skin from cold weather? I like to add healing essential oils to my moisturizers, balms, and facial oils. 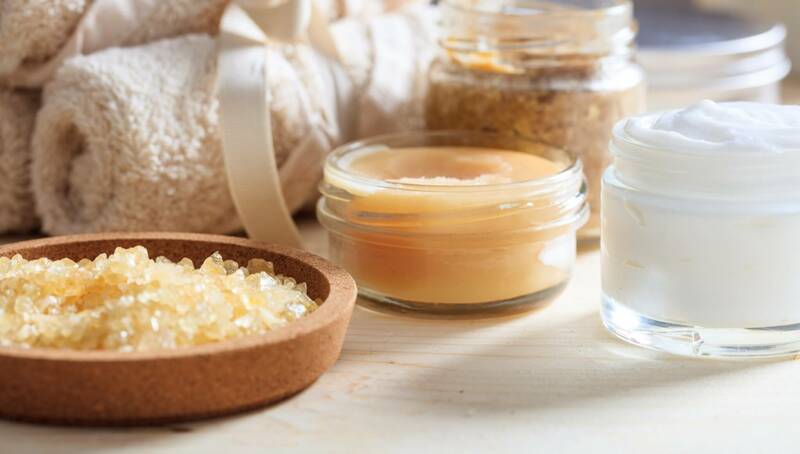 I recently discovered this DIY miracle balm at a spa event we had, and it is now a part of my nightly routine. I also apply it on the back of arms to keep my Keratosis Pilaris under control and keeps my skin ridiculously smooth. If you have eczema, give it a try also! Jojoba oil is amazing as it is similar to the sebum our body naturally produces. How do you balance between cold weather and indoor heat? You can also add these to winter salves and body butter to slather over dry, cracked skin for extra moisture and to your skincare! Add a drop to your toner, cleanser or moisturizer. Additionally, I add an extra mask to my weekly skin care routine in the winter. Typically, I only mask one time weekly; however, in the winter, I add an extra hydrating mask. Tip: I keep my eye gel pads and a few sheet masks in the fridge to have a nice cooling and de-puffing effect. How do you choose the right moisturizer? Determine if your skin responds well to a moisturizer, balm or facial oil. You will immediately know if it is too heavy for your skin when you see any unusual congestion. Any suggestions on how to give TLC to cracked hands and feet? 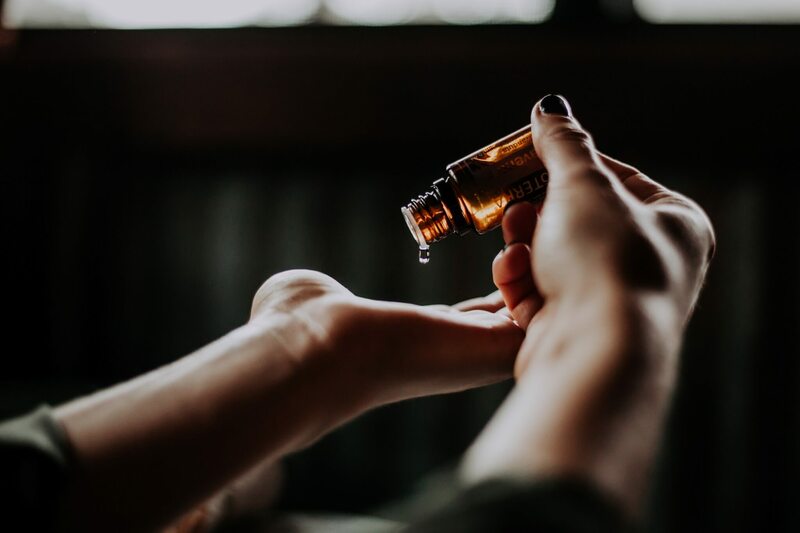 Use heavier balms, oils, and salves with essential oils to heal them. As an esthetician who washes my hand and uses gloves frequently, my hands can crack in the winter. During those times, I add a thick healing balm to my hands (and feet when needed) and wear a pair of cloth gloves overnight and socks to lock in the moisture. You can prepare your balms and salves using the oils I have listed above. Remember to protect your hands with gloves on while doing regular household tasks like washing dishes and cleaning. How about facials or chemical peels – should we avoid the frequency? Now is the best time to get your chemical peels. You need to remain indoors and away from UV exposure after peels and allow that fresh new layer of skin to heal. Peels are great for softening those crow’s feet, soft wrinkles around the lip and eye, as well as those pesky hyperpigmentation issues. Another tip: I like to have my annual dermatologist skin checkup in the winter (or fall) season. If anything needs to be removed, allow for proper healing and try to stay out of the sun. If able, get your laser treatments done now as well (this includes both face and body). Is there a need to alter diet for this season? Healthy eating is always essential for great skin, and I do not take off during the winter. My diet always includes those rich Omega-3 foods like walnuts, salmon, chia seeds, flaxseed, and avocados. Omega 3’s hydrate your skin from the inside out, so I like to increase my intake during the colder season. If you’d prefer, you may substitute an Omega-3 supplement to your diet. Antioxidants are also essential, so a handful or two are usually in my shakes or oatmeal. I like to add Collagen peptides, spirulina, unfiltered Apple Cider (just a tablespoon) and adaptogens to my smoothies. My nutritionist also recommends increasing my veggie intake by adding zucchini and cauliflower to my smoothies. For a faster and efficient way of getting ready for my week, I chop bananas in halves, along with zucchini and add to snack baggies and freeze them ahead of time. It is so easy to grab the bags, drop the frozen veggies in the blender, and sweeten my shakes naturally with a frozen half banana. 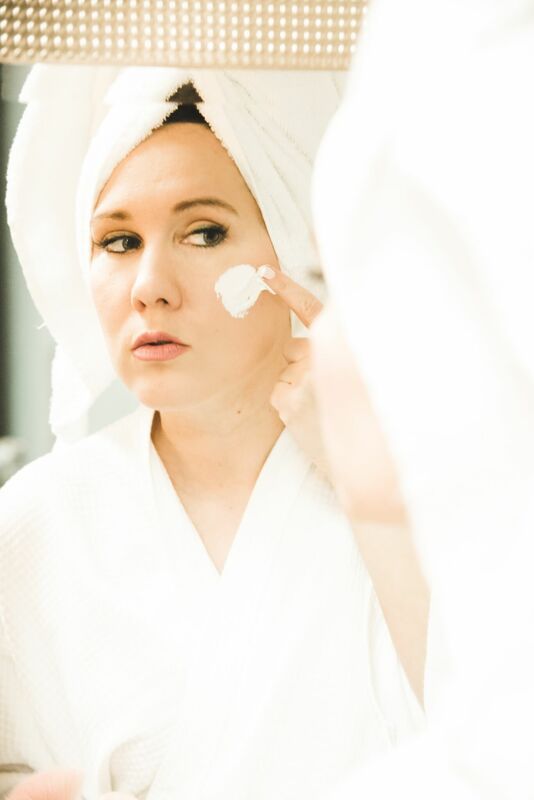 Thank you, Lindsey, for taking time and sharing your winter care regimen with us! Be sure to follow Lindsey on IG and her blog! What are you currently doing with your winter skincare regimen? Please comment below, as we would all love to hear what works for you! Glad this helped you, Gabrielle! Have a great day! Thanks for the info,tips and great DIY cream. Hi Debbie, you’re welcome! Thanks to Lindsey for sharing! This is so helpful I can’t wait to try the miracle oil recipe myself! Yes, let me know how it works out for you! I love the DIY miracle cream considering I have all the ingredients. I keep hearing how frankinsense is good for one’s aging skin! Great ideas that Lindsey has. Yes, so glad she shared it with all of us! Let me know how it works out for you! Glad you find it helpful! Thanks for reading, Dina! I can’t wait to whip up a batch of the DIY Miracle Cream. I t sounds wonderful. Awesome! Let me know what you think! Lindsey will be happy to hear this! I switch to a heavier moisturizer in the winter. Thanks for all the info! 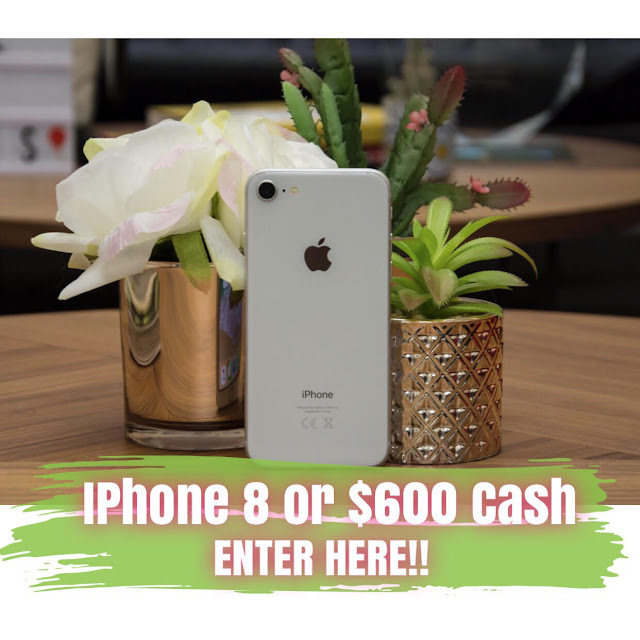 Thanks for stopping by to read the post! Have a great day! When I was younger, I had oily skin. I knew everything about taking care of oily skin. Then, boom, I hit my 50’s, and my skin was dry! Now, I feel like I have to learn everything all over again. Yes, thankfully there are many products out there to help us adjust according to seasons. Hoping you have found a regimen that works for you, Tamra. Dry skin is always an issue for me. Thanks for the information. Hi Nancy, hoping this post help provide some information you can use for your regimen.